Okay, for those paying close attention to our restoration articles, we did say that the T-Bird would look externally faithful to the original cars and that the only modifications would include the front suspension/steering, brakes and stuff like that. That's not totally true. During the planning stages of the project we included air conditioning as a "must-have" option. 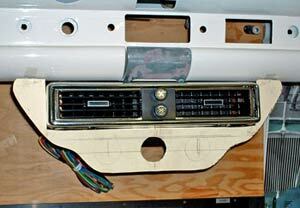 Like the original cars, our A/C evaporator housing will hang from the center of the dash. Unlike the original units, ours' has horizontal outlets, but we do plan to modify some old dash knobs for its fan and temperature controls. The A/C unit fits nice and snugly under the dash. While the dash was hanging out of the way in the office we used the opportunity to fit the evaporator to it and drill the necessary mounting holes. Once that was done our minds started working. Should we paint the housing to match the bottom of the dash (white)? Will the ashtray be able to be grabbed from underneath after the A/C housing is installed (the answer was no)? Where can we mount our (planned) engine temp, oil pressure and voltage gauges? Where will we relocate the hood release bracket and mount the new choke cable (we chose to use a manual choke on the engine's new carburetor)? Then it occurred to us: we might be able to create a vertical console that would incorporate everything. If it were shaped in a way that mimics the curvature of the dash and could surround the A/C unit, it could be made to look like Ford had designed it back in the 1950s. We got to work with some stiff construction paper and took careful measurements of the A/C unit. Once we had cut the paper to the proper shape and drawn centerlines for the gauges, we played around with various outer shapes until we found something we liked. We taped the final shape to the dash and stepped back to admire our work. This looks very close to what we think would have been a console shape in the '50s. There's only one hole in the paper at the moment so we can use the center points to mark the sheet metal later. The new console would have to be pretty rigid in order to hold the gauges, hood release and choke cables. It would also have sides, so we used our paper shape as a template for cutting sheet metal. For this task we used one of our (many) sheets of 24-gauge metal that we got from a real estate company that moved away a few years ago. 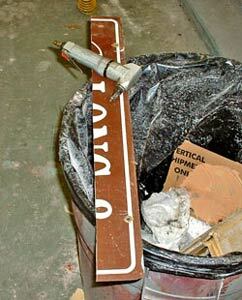 These old metal signs are very useful for such projects and they were free, so why not? We cut out our panel shape and started the process. 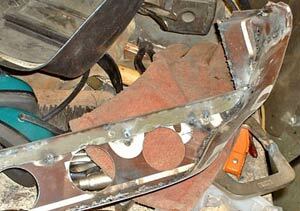 Once we had bent the metal to the bottom shape of the dash, we cut out the "final" shape. This was a good time to drill out the holes for the gauges. 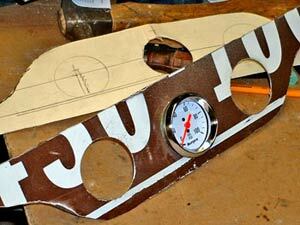 Always test-fit the gauges before proceeding. Having to enlarge holes after painting is dangerous. 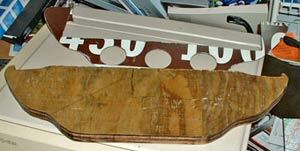 Now for the sides of the console: to do this we created a plywood "form" the exact shape of the front panel. 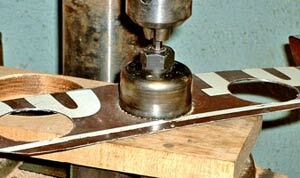 Using our air nibbler we cut a straight, flat strip of metal. 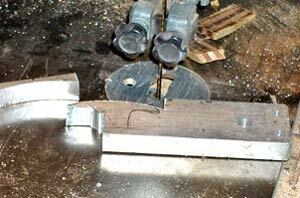 We then clamped our front plate to the wood form in the vise and bent the straight piece of metal over the form. 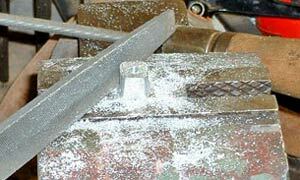 We felt this was the best way to weld what would be the sides to the front plate, while maintaining the perfect shape. The form is ready to use. We cut a straight, flat strip of metal. It's getting ready for welding. 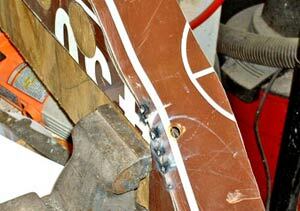 We tack-welded the side piece every few inches along the seam, taking our time to keep the curved shape. 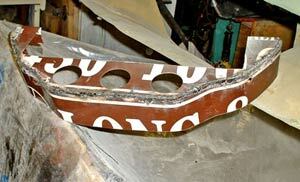 Once we were satisfied with the overall shape we ran a weld seam all along the panel. We also cut a length of 90-degree sheet metal to fit the inside of the console, just over the tops of the gauges, and welded it to the panel. This piece would serve to stiffen the console and act as a shelf under the A/C unit. Little welds are much easier to remove than one continuous seam, so tacking is the way to go. After a little grinding we had our basic shape. The stiffener piece all welded in. After welding a couple extra pieces of sheet metal to the inside mounting area of the console (to help stiffen it where the hood and choke cables are mounted) we coated the entire piece with body filler and sanded everything smooth. We wanted to be sure the finished piece was flawless, since it has to look just as good as the dash. This required several applications of filler to take out all the little dents and scratches. It's now ready for primer. Remember the hood release? It's a T-shaped chromed handle that's stamped with the word "hood." In order for the new choke cable to look reasonably good we needed to create a similar-looking handle for it. We decided on using aluminum since we could cut and shape it easily and then polish it to a chrome-like sheen. Taking a piece of 3/8 stock aluminum, we drew a handle and cut it out on the bandsaw. Yes, it's a wood cutting saw but aluminum doesn't dull the blade very much. 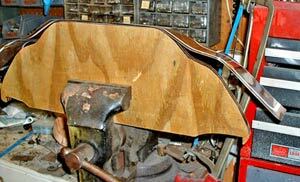 Once we had the basic shape we started filing away to create the curvature. This took about a half hour and a little patience, but the finished handle looked pretty good. 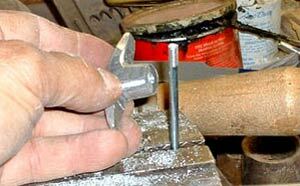 Before polishing we clamped the handle into the vise and drilled a hole in the bottom. This was tapped to the same thread as we created on the end of the choke cable. 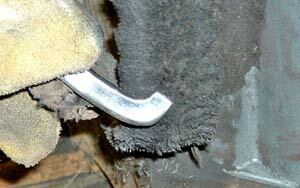 Satisfied that the new choke handle would thread properly, we polished it to a smooth, even sheen on the buffing wheels. 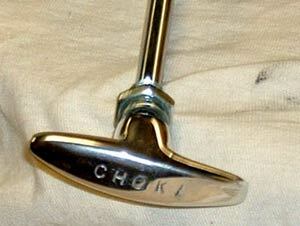 Afterward, we took out our metal stamping kit and free-handed the word "choke" onto the top surface of the handle. Filing away everything that didn't look like a handle. We had removed the plastic choke handle and threaded the shaft, so now the two pieces could be mated. We think it looks pretty cool! Now we turned our attention to the ashtray. On the original cars the tray was pulled from the bottom, but the A/C unit will block access. Although we won't be using the ashtray we still felt it should be operable, so we created a handle to pull it out. Once again, the aluminum stock was pulled out and we cut an appropriate shape for a handle. Once we cut the basic shape we sanded and grinded and filed until it had smooth contours. 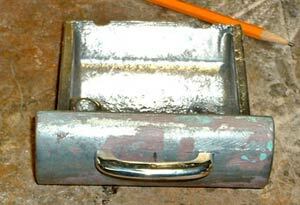 We drilled and tapped holes in the new handle and then measured and drilled holes in the ashtray face. The new handle was mounted and everything tested out. This looks enough like something from the '50s, we think. It's being buffed smooth at this point. This will do nicely, won't it? We decided on a last little touch of detail for the gauge area. 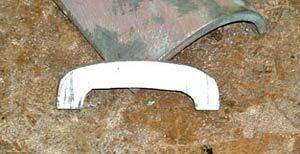 Since the dash itself is trimmed with machined aluminum – and we had some extra pieces from another car – we played around with a shape that might be appropriate. The shape we settled on is a broadened version of the Thunderbird emblem. We made several test drawings that would mimic this shape and adjusted them to the gauges and console shape, then cut them out of an area of an old piece of door trim. This is going to work out, we think. Lastly, we prepped and painted the dash, ashtray, glove box door, steering wheel (more on that in another article) and console with several coats of the off-white interior color that matches the upholstery. After a few days of curing we assembled the gauges, backed with the aluminum trim, and cable controls onto the console. Now you have to admit it, this looks right out of the 1950s!